This is a post by Michael, Daniel’s father. Daniel is a 17 year old who has severe Autism. Daniel has, over the past year, taken and completed 6 Coursera courses. Their journey warmed our hearts and we asked Michael to share it with the Coursera community. We hope you enjoy Daniel’s story as much as we have. It is impossible to overstate the benefit and happiness that Coursera has brought to our son Daniel and our family. 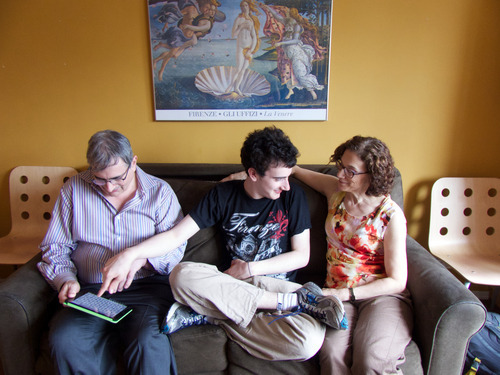 Five years ago (next month) our severely autistic son Daniel had a major breakthrough. Then twelve years old, with a using vocabulary of thirty or forty words (though we knew he understood far more) he suddenly learned to answer questions by picking the answers out, one letter at a time, on a letterboard. Within a couple of weeks, Daniel could use the thousands of words he had heard but could not speak. Reading one sentence at a time makes for slow going, so to make it worthwhile for both of us I started reading Danny A Midsummer Nights Dream which is delightful at that pace. Daniel had great difficulty with reading that went too fast, but once I went slowly enough it didn’t seem to matter how difficult the content was! Soon my “comprehension” questions went beyond “what’s happening” and became about rhyme, symbolism, metaphor and dramatic structure. It didn’t matter to Daniel: as long as he was answering questions, he was following the story, and the tougher the questions the more he loved it. By the end of the seven months it took us to finish the play, Dan had become an expert close reader, a skill which would enable him to take Al Filreis’ Modern & Contemporary American Poetry class, the Coursera class that changed his life again four years later. By the time someone sent me Daphne Koller’s TED talk and we discovered Coursera, we were well into the groove of teaching Dan at home. Dan loved learning and kept steering us towards subjects where he would be asked to compare ideas because connecting different pieces of information into knowlege made him feel, as he spelled to us, “less autistic.” Dan is eager to go to school, but is unable to sit still quietly in a classroom, and unable to communicate abstract thought except by letterboard. Even more limiting, he is dependent on an adult to bring him to the task, keep him working on it, and hold his hand while he spells. Coursera seemed like a possible bridge between home schooling and what Dan called “going to a real school,” but it turned out to be much more. In September of 2012 there were not yet many humanities courses on Coursera (remember Dan wants to be made to compare ideas, so the humanities are better for that than many hard science classes) so I helped him sign up for two courses from University of Pennsylvania: Al Filreis’ Modern Poetry, known to its legions of worldwide fans as ModPo, and Peter Struck’s Greek and Roman Mythology. Dan received many shocks and rose to many occasions. The biggest shock was having to keep up. It had taken us months to read our first Shakespeare play and now I had two weeks to read Dan The Odyssey. Until Coursera, my wife Meredith and I had been so thrilled that Dan could understand literature that we gave him as much time as he needed. Coursera ended that luxury with a bang. True, the online lecture format made it easy for me to stop the video and ask Dan questions, and we could repeat things he didn’t get the first time, but basically Dan had to keep up. And he wanted to keep up and that was a tremendous growth experience. He discovered that he could understand the Odyssey with only two or three comprehension questions per book and keep up the relentless pace of a college course, studying whether he was in the mood or not (special ed can be very forgving. Dan loved having an objective standard he had to keep up with). Then there were the quizzes. After the first one or two we stopped reading the questions aloud and started dragging his finger across the question on screen. He would then respond by tapping the answer on the screen. Dan can’t use a mouse but we quickly discovered that if we got the quiz on an iPad the touchscreen enabled him to read and answer the questions on his own. Once or twice he realized that he could make a case for more than one of the offered quiz answers being right and he discovered the phenomenon of second-guessing the professor. The in-lecture quizzes are always easy for him becase they are like the stopping to ask a comprehension question, which he knows so well. Then there were the online essays to write and peer-review. Although Dan doesn’t yet read for pleasure on his own he learned to read the 500-800 -word essays of his classmates, and this young man for whom writing a couple of sentences on the letterboard had been a big deal began to be able to write and construct an argument in logical order. As a peer reviewer he experienced the anguish of hating a badly written essay but not wanting to give a failing grade. He glowed with pride when his peers gave him high marks, and suffered the one time he got a less-than-passing grade from his peers (he did well enough on the other essays that he still passed the course). When it occurred to him that he could write an essay about Frank O’Hara in the style of a Frank O’Hara poem he was filled with pride and he waited in suspense to see whether his peers would like it (they did). Dan has now earned six certificates and has learned from dipping into several other courses as well. It’s a great introduction to college learning. 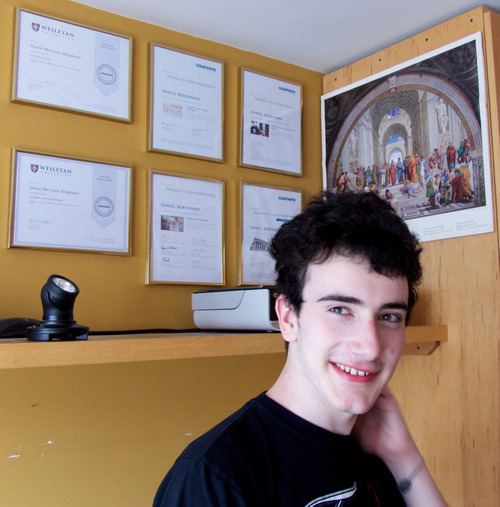 It is something new in the world for an undergraduate –especially a seventeen year old autistic one– to be able to study Ancient Greek literature from very different points of view at Penn, Wesleyan and the University of Virginia. This whole world is new to him: standards, peers, comradeship and competition. And with his induction into this world came something that would surprise some critics of MOOCs: Daniel experienced a dramatic decrease in his sense of isolation. There are emails and forum posts and people who accept Dan despite (or ignoring) his autism. But there are also in-the-flesh encounters stemming initially from Al Filreis’ commitment to openness and his invitation to his students to drop by Kelly Writers House at Penn. We took Dan there and Al spent time with him, and the TAs, familiar from the video lectures, were friendly and accepting and Dan began to get a sense that there might be a community he could be part of some day that had nothing to do with autism. Emboldened by meeting Professor Filreis, Danny asked me to write to Peter Struck and he met us too. We have hopes of meeting all Dan’s professors – and one is in Jerusalem and several are in Edinburgh! Some of the 49 Courserians who are Danny’s Facebook friends will probably become non-virtual friends in time. He even had a moment of stardom. We took him to the ModPo final webcast at Penn, and at one point one of the TAs asked members of the audience to pick two words that encapsulated their ModPo experience. Dan’s were “not impossible” and under Al Filreis’ gentle urging he managed to say those words aloud to however many hundreds of people were watching around the world. Someone made a forum topic out if it and for 72 hours “Not impossible” was the top thread on the ModPo forum as people wrote in from all over saying that Dan had inspired them and that “not impossible” was going to be their new watchword. Can you imagine what it does for a person like Daniel to feel useful? So it seems as if every element which Coursera has invented to make its online courses more college-like has had some role to play in the reduction of this one teenager’s disability. Daniel’s Coursera password is built around the word “cure” and he has a point. As I finish this post, I am going to Daniel’s room to read him he rest the rest of Book 24 of the Iliad. When we are finished we will re-watch “Professor Andy’s” lecture from Wesleyan’s The Ancient Greeks course. The material is similar, in some ways to the material in Peter Struck’s “Greek and Roman Mythology” course from Penn, so it does Daniel good to compare and contrast not only Achilles and Hector but also the two courses. Plato’s Apology is discussed in the Wesleyan course and also in “Know Thyself” from the University of Virginia. edX now offers Professor Nagy’s course which studies the Iliad from a completely different point of view. This highlights an astonishing aspect of MOOCs. Decades ago when I was an undergraduate, I would have accepted the idea that any educated person would have to study, at least a little, the literature that has come down to us from Ancient Greece. But who ever got the chance to experience and compare the subject as taught at Penn, the University of Virginia, Wesleyan and Harvard? At the age of 17? What Daniel will do with all this remains to be seen. But the fact that he will have a chance to do it is a gift from Coursera.